I can’t discuss my heroes without also discussing adoption. For me, the two are inextricably linked. And I wouldn’t have it any other way. It’s funny, in the adoption world there really are no rules or solid expectations because no two stories are the same. Even the stories experienced and told by siblings differ. There are feelings that are similar in most stories, there are processes which mirror one another, there is heartbreak felt by someone in all. There are general guidelines we all follow or implore others to follow to make the whole thing hurt less, but what helps one hurts another, so again, no rules. We have our own language – words such as “birthparents”, “first parents”, “adoptee”, “adoptive parents”, “triad”. We have our own way of building our families: I have two biological parents (who I refer to as ‘biological parents’: ‘biological mother’ and ‘biological father’) and two adoptive parents (who I refer to as ‘parents’: ‘Mom’ and ‘Dad’). For some, all are just “parents”. For some, siblings are lost; for some, siblings are gained. I lost a sister to adoption, but was lucky enough to maintain a friendly relationship with her through my childhood, and we’ve become sisters and close friends again in adulthood. Some retain relationships with their nuclear and extended biological families. Many people come to terms with their delicately-stitched-together families…and some never do. I appreciated the intricate pattern of my family tapestry from the moment I moved in with my parents. Some people are adopted from awful birthfamily situations, like I was. Some are adopted from birthfamilies who cannot handle more children, or who aren’t ready for children, or who make the decision to relinquish to keep their children safe. Some relinquish multiple children, sometimes voluntarily, sometimes not. Similarly, some people are adopted into awful situations where they are abused or neglected, never experiencing love or any connection to their adoptive families. And some enjoy an incredible life with their adoptive families, as I have. Every adoption story is unique and important. Mine led me to be the daughter of two amazing people; to being raised by people who nurtured me and taught me to become exactly who I truly am. My adoption story started about 26 years ago when my biological father’s parents, Chris and Dave, adopted me and my brother, David. They opened their hearts and their home to remove me and David from a situation of neglect, abuse, and abandonment. They put everything they had into raising us: their love, their strength, their tears, their time, their money. They sacrificed so much in order to be there for us and give us the best childhood possible. They took the lessons they learned from raising their first two children and, in my opinion, did an even better job with us because of those lessons they learned. My parents, my absolutely real parents, are my heroes, whether they see themselves that way or not. They saved me, rescued me. They love me exactly as though I was born to them. They raised me with respect, dignity, intelligence, and kindness. They watched with loving trepidation and genuine support while I attempted to make connections with my biological parents, and comforted me when those connections weren’t made and ended in heartbreak. They never, not even once, used the fact that I’m not their biological child against me. They never lied to me. They never exaggerated the truth. And somehow, they’re both too modest and honest to see themselves as heroes. Boy, are they wrong. Merriam-Webster defines ‘hero’ as: a person admired for achievements and noble qualities; one who shows great courage. My parents have successfully raised four children (an achievement). They had both the forethought and reflection to adjust their parenting styles when they adopted me, their only daughter, to ensure they were not only teaching in accordance with the current decade but also to instill more defined and thoughtful lessons in me (noble qualities). They were near to retirement, empty-nesters, when they made the decision together to take us in and disrupt the life they had built together in order to put us first (great courage). I think it’s only natural that I define ‘hero’ as: Mom and Dad. I love you, Mommy and Daddy, and I am eternally grateful for the amazing people you are, the selfless things you’ve done for me, and the life you gave to me. Who is your hero? Tell me about them in the comments – let’s always remember to praise those who have helped us to grow! 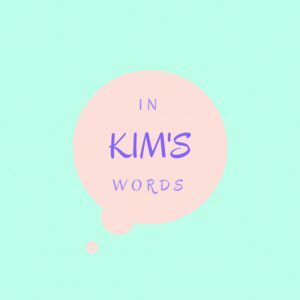 Subscribe to In Kim’s Words for the latest heartfelt content delivered straight to your inbox!